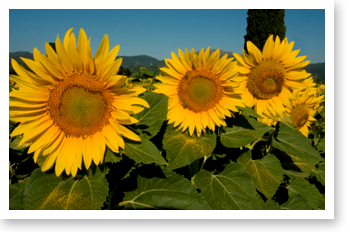 Italy’s historic Tuscany & Umbria + exploration of the food and wine of the two regions. A Culinary Adventure. Group Size: 8 to 12 people – This unique tour of Italy is also available for private groups, any size, any travel dates. To really experience Italy’s authentic food, wine and culture, you must visit the countryside. On this upscale small group tour of Italy, we’ll visit charming, historic yet often overlooked small towns and villages like Volterrra in Northern Tuscany known for alabaster, and Bolgheri in Tuscany and Norcia in Umbria for their fine local wines, cured meats, and other products straight from the source. On this culinary adventure, we will tour Italy’s two diverse regions – Tuscany and Umbria – each with their own unique flavors and specialties. We’ll experience the great diversity of regional food and wine – from truffles and olive oil to fantastic cheeses like Pecorino. We will also visit several wine producers, refining our palates as we discover the subtle differences in Tuscan & Umbrian wines from San Gimignano, Chianti, Bolgheri, Montalcino, Montepulciano and Montefalco. Along the way, we’ll go truffle hunting, take a cooking class at a farm, visit olive oil producers, lunch at our friends’ home in Umbria, drop in on an annual village festival and more. A unique touring experience awaits you in Italy. Note: Activities or order of activities are subject to change due to unforeseen closures, schedule changes, etc. We reserve the right to replace an activity. 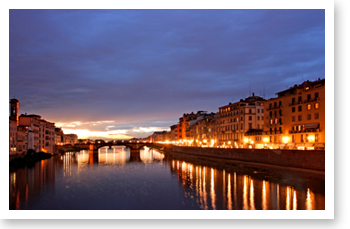 NOTE: Optional tour extensions to Rome and Venice are described at the end of this tour package. Today you will explore Volterra, an ancient Etruscan town enclosed by intact 12th-century walls, with remnants of its defensive walls and Porta All’Arco gate dating back to 7th century B.C. Y ou will have a guided tour of Volterra with a local guide, who will take us to see the local alabaster artists at work and shop for souvenirs. You’ll have free time to explore this fantastic city and have lunch on your own. You may choose visit the Etruscan Guarnaci museum, one of the earliest public museums in Europe, which houses some of the most important collections of Etruscan antiquities. You may also choose to visit the Alabaster Museum, which displays more than 300 alabaster sculptures from three centuries past, among other fine works of art. Today you will enjoy one of the most picturesque areas of Tuscany, the scenic wine-making Chianti region. We will spend the day in Volpaia, a 12th century village dedicated to the production of wine. In the 1970s, Volpaia’s former homes, churches and underground passages were converted into wine cellars and olive oil presses, connected through an underground “wineduct.” You’ll have an opportunity to tour the town’s namesake castle and winery, Castello di Volpaia, and taste the Chianti Classico produced here. Volpaia’s wines are all made strictly using organic production methods. Your guide will introduce you to the town’s rich history, such as the della Volpaia family. This family made their fortune as master clock and instrument makers and counted Leonardo di Vinci among their closest friends. Today you will enjoy two towns known for wine. Your first destination is the charming village of Montepulciano. It is one of the highest of Tuscan hill towns, built along a narrow tufa ridge, with a long main street and alleys that drop away to the walls. We will enjoy a tour of a fine wine producer with a historic wine cellar, and then give you free time to shop, have lunch and explore the town. Next we’ll stop in Montalcino, the proud home of one of the finest wines of Italy, the Brunello di Montalcino. You can pick up a few bottles of this fabulous red at Croce di Mezzo, a family-run winery where we will have a private wine tasting tour. This morning, you will have time to explore the romantic streets of Pienza, a UNESCO World Heritage Site. 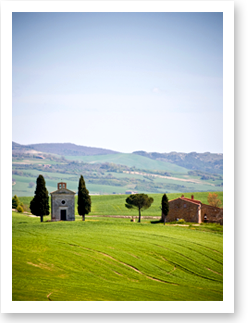 Pope Pius II conceived Pienza, his birthplace, as a Utopian “new town.” The beautiful Via del Casello offers a spectacular panoramic view of the Orcia Valley, and there are several beautiful plazas and palaces for you to stroll. You may also enjoy the great shopping in Corso Rossellino, or visit the beautiful cathedral and the Pope Palace. This morning we will travel directly to Spoleto in Umbria, your base for the next 3 nights. This walled city has its origins deep in ancient history. There are many historic sights of interest here, including the church of the Madonna of the Snow, built on the ruins of a Roman temple, and an ancient Roman bathhouse featuring mosaics depicting assorted sea creatures. After we check-in we will go spend some time in town for a guided tour of this beautiful town and for some free time for lunch. In the afternoon, we will drive a short distance to Montefalco, known for fine red wines such as the Sagrantino. We will visit a great wine producer for a tour and tasting, and have the opportunity to buy some of their well-known vintages. We may also tour one of Montefalco’s beautiful churches, which cover the Romanesque, Gothic and Renaissance styles. The beautifully frescoed church of San Francesco has been converted to the town’s museum, offering an extensive collection of art and artifacts from Umbria. Next we will stop to visit an extra-virgin olive oil producer between Spello and Trevi. This area is known for the best olive oil in Umbria. You will get to see the olive mill and cold pressing machine in action, then taste the oil with some freshly baked Umbrian bread. After, we will have a short visit of steep and ancient Spello with its Porta di Venere, a gate from 1st century B.C. Our activities today include truffle hunting -black truffles. We will have the aid of a special local guide, a truffle-hunting dog, who will help us find these rare treasures of the forest floor. Following our truffle hunt is a cooking class and lunch with a dish featuring truffles. Today we will also visit Norcia, the birthplace of St. Benedict, the patron saint of Europe. Norcia’s basilica is dedicated to St. Benedict, still attached to a functioning Benedictine monastery. Norcia is also the birthplace of several culinary specialties. The wilderness around Norcia is known for mountaineering and hunting, especially wild boar, which are often made into sausages and ham known in Italian as norcineria. 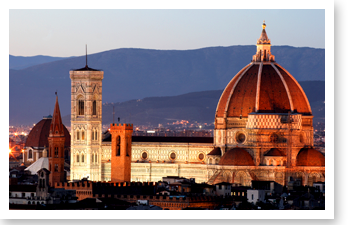 On your last day of the tour, you will finish in Florence, stopping en route in Orvieto, an important Etruscan town, for a guided tour of this interesting city. Arezzo is known for its antiques market and shops; we’ll stop for a guided tour and some free timet for you to explore, have lunch, perhaps tasting Arezzo’s famous Acquacotta, a bread soup made with porcini mushrooms.